Well hello everyone I won't ask if you've missed me as I haven't posted regular for quite a while. Now the one thing I was a bit disappointed in was for as long as have been in blog world people have been going on about how amazing Micheal's is and "you have to go there" well I did and it didn't amaze me it was just like walking into Hobbycraft, yes things were cheaper than over here but that was the same with most things the only thing that did get me ohhing and aarring were the embossing folders I brought quite a few back as they seem to have more choice than us but other than that I felt let down :o(. Of course that didn't stop me spending a small fortune in there (well you have to don't you) I think I was expecting it be totally different to anything we have over here with what I had heard about it some things we can't get over here there wasn't a lot different. I did manage to get a friend a gorgeous cross stitch pattern hope it gets her Mojo going again so see what I got wasn't all for me hehe. I have a few stories to tell too but will do that when I get the photos. The flowers that I added are from USA and France I got them when I was there for my birthday. Thank you for joining the Crafting At The Weekend Challenge, hope to see you again soon. 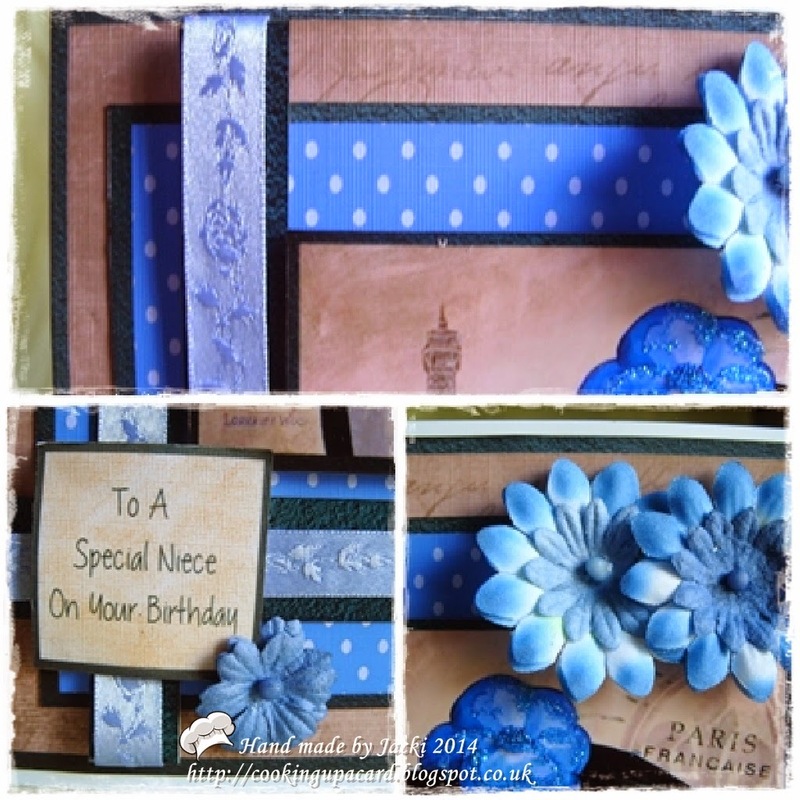 Love the image and your layers and details!Blue and Brown are a favorite combination of mine. Thanks for joining us at Sugar Creek Hollow!! Beautiful card with lovely colours. Thanks for sharing your creation with us at Sugar creek Hollow this fortnight.